Shoppers looking for a new television got more than they bargained for when an evil prank left them terrified – and likely phobic of all things electronic. 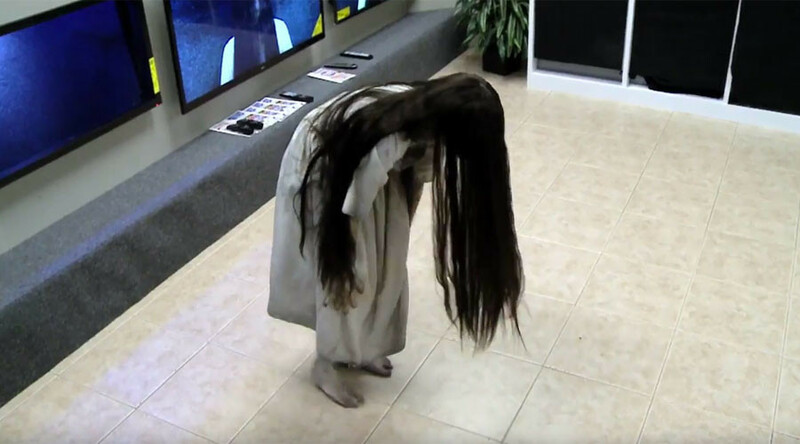 An actress, dressed as the famous girl character Samara from the ‘Ring’ horror movies, recreated a popular scene where an evil spirit crawled out of a television screen. Sales assistants in on the prank were talking unassuming shoppers through the various television sets when, while backs were turned, out crawled the horror character. Obviously the shoppers don’t hang around, with most dashing for the exit. The wall of television sets was showing a trailer for the latest ‘Ring’ movie – ensuring the victims had the gruesome character fresh in their mind.